Aim: The aim of this study was to test the hypothesis that postexercise CWI (considering the associated reductions in skeletal muscle blood flow) attenuates muscle glycogen resynthesis. Methods: Muscle glycogen resynthesis in the vastus lateralis muscle was measure during a 4-h recovery period from an exhaustive exercise. Cold water Immersion (CWI – only lower limb) consisting of 10 min with a water temperature of 8’C. In addition this study used a postexercise carbohydrates (CHO) feeding protocol of only 0.6g pr. kg body mass after 30 minutes, 1h, 2h and 3th hour. The reason for this protocol is to be representative of actual practices undertaken by elite athletes. More test was taken during the protocol biopsi, muscle glycogen, blood analyse, thermoregulatory respons. 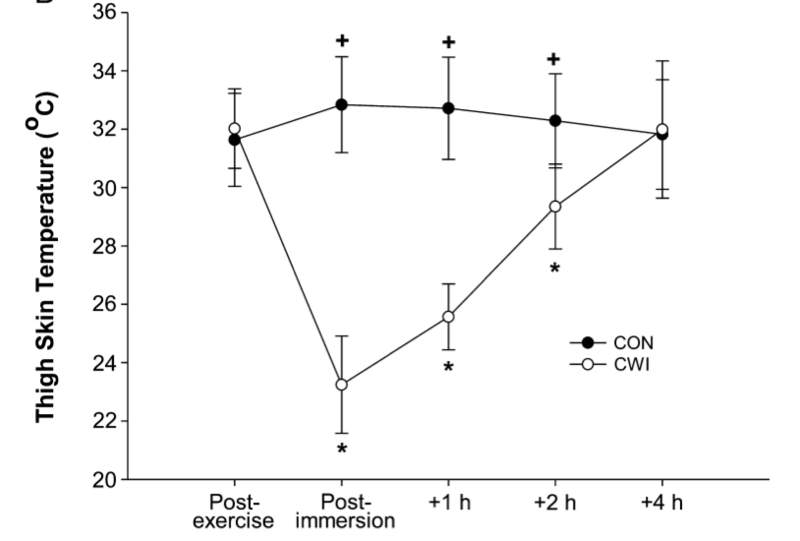 Reductions in thigh skin temperature and muscle temperature during post exercise recovery were greater in CWI compared with control. In addition, norepinephrine (same as noradrenaline) and blood glucose concentrations were increased and decreased, respectively, during recovery in CWI compared with control. 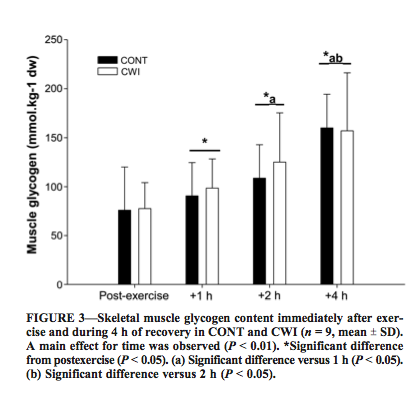 The present data demonstrate that post-exercise CWI does not attenuate muscle glycogen resynthesis rates during short-term recovery. According to the authors, the present data have a practical implications and suggest that athletes who incorporate CWI as a recovery strategy to alleviate symptoms of exercise-induced muscle damage should therefore not be concerned with potential negative effects of the associated reductions in muscle blood flow on the restoration of muscle glycogen stores.